While I still play Pocket Planes on a daily (hourly) basis, the game isn't without faults. It was also apparent to many people I knew who played Tiny Towers religiously but quickly backed off away from Pocket Planes. I'll list a few in mind, and perhaps suggest something that would have remedied the problem. While the amount of player choice in Pocket Planes is commendable, it leads to player paralysis: players are given so many choices (all seemingly different, but in non-obvious ways), they end up feeling lost and not sure what to try. What plane parts should they buy? As long as they're available, they can be bought; Yet how should they know if that's what they wanted? (Hint: They don't get to know). What's the ideal next city to expand to? The game doesn't prevent you as long as you have the cash, but with so many choices, players who don't have a goal in mind will just be sitting there debating all the outcomes and never arrive at anything meaningful. An even more deadly situation arises when players make bad decisions: Bought a city too far that none of your fleet can reach (and there's no way of visually seeing that info unless you are trying to fly a plane), then you're forced to either live with it or sell the city back for half it's cost; Bought the wrong plane parts? Good luck waiting for the next one to randomly generate. Every mistake a player makes (and the more costly these mistakes they get), the more likely the player will avoid decisions because of it's large negative consequences. In Tiny Towers, players are visually reminded of how much they've achieved with every new floor they build. This visual cue of player impact on the world is unmistakable, and it works in reminding the players what they're trying to achieve and what they've already done. And the above screen is a great shot of "progression" in Pocket Planes: none. Since cities can be shutdown (and highly encouraged, see below), the only constant growth players will see is in their in game bank account, fleet size, and increased choices. Some players may find the "bigger number" appealing enough, but for most, this lack of visual feedback impact will severely dampen the experience. Ideally, the game should have artificially locked away stuff that wouldn't have affected actual gameplay: Why show all available planes to the player at the start of the game when they cannot afford them (instead, show "secret planes", only to be revealed when they get them). Personally, I would have gone further and restricted certain cities to be only available after certain level cap; however, this would be counterproductive to the actual "open choice" design. Deeper Management ... for Who? Another feature that Pocket Planes offered above Tiny Towers was it's deeper management. Players have numerous ways to approach the game to suit how they want to play: Want to operate a large fleet within a very small area, flying passengers to any adjacent cities? Sure! Rely exclusively on layovers, flying passengers to major hubs to gather bonus? Why not! Ground all planes until they're full? Definitely. However, does everyone want this choice? Casual players coming from Tiny Towers who enjoyed it's simplicity and (extremely) light management may find these choices and micromanagement frustrating. Customizing when and how to load a plane for maximum profit may be appealing for some, but the micromanagement (and the numerous button clicks required just to fly a plane) will annoy casual players, driving them away. NimbleBit had somewhat actually addressed this issue with the "quick load/unload passenger/cargo" button, but I would go even one step further: automatic destination setting - A flight should have a way to automatically fly to a destination based on the majority of it's jobs onboard. Such a feature removes the somewhat cumbersome step of map manipulation. (Additional aside: Tiny Towers thrived on the fact that the game can be played single handed: flicking to the right floor, stocking and choices can all be done by one finger; Pocket Planes, by it's horizontal layout and 2D map will require more player interaction by default. As casual games that are meant as small toy distractions, Tiny Tower has a much lower "attention requirement", which makes it much easier for player to stick to and come back and play). 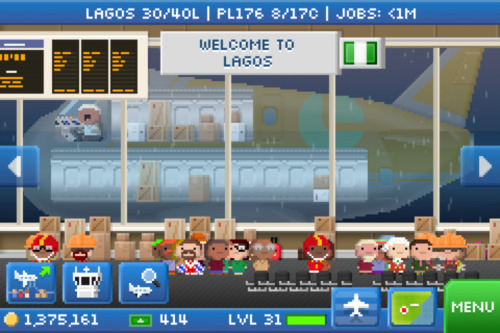 In contrast to Tycoon games, players systematically do worst as they increase the number of airports opened. Larger planes (and planes unlocked later) doesn't actually yield more profit, slower ones do. Upon seeing the game, most players will naturally gravitated to the goal of get as many airports as possible. It's interesting to note that the game populates jobs in each city based on city size, not number of cities available (limits the scrolling in the job screen), which leads to the side effect of making it hard for players to maintain a profit without long waits. Players who choose to keep lots of cities will eventually find themselves with many planes and not enough jobs to fly to a destination. Personally, I've flirted with 20+ cities, but have eventually settled down closer to 8~9 as the "right" amount. The end-game planes (such as the Cloudliner, pictured above) being less profitable was also baffling: players usually expect items locked away as superior items, but Pocket Planes holds the opposite to be true: in all classes, the plane that is easiest/cheapest/most profitable to operate (Kangaroo, Aeroeagle, Sequoia) were unlocked relatively early. This is a baffling choice because when players experiment (by spending and betting on the new planes) and fail/lose money, they begin second guessing their decisions, and make less interesting choices within the game. The challenge of upstreaming users, at what cost? I think Pocket Planes is actually an interesting case study on follow-up games to successful IPs (other notable ones includes Angry Birds -> Angry Bird Space and Flight Control -> Flight Control Rocket). When a casual game becomes a runaway hit, how should developers handle a sequel? Is more of the same good enough? How different can the game be without alienating the original fans? More importantly, as casual games, is it wrong to expect that these players will upstream into more core experiences?